Reasons for gas formation is type of food that we consume, medical reasons, surgery or over eating. In such cases try these simple remedies at home. Wash bunch of curry leaves and air dry. Transfer to a frying pan with half cup cumin, few pepper corn and salt. Add little asafetida powder. Do not add oil. Fry the contents and cool it to room temperature. Transfer to a dry grinder and prepare fine powder. Mix with oil and have with idli and other breakfast items. To one spoon of crushed coriander seeds add half inch dry ginger. Add this mix to one cup boiling water. Strain and add 2 tsp honey and drink. Pepper and asafetida: Mix 1 tsp coarse pepper with little asafetida. Add it to rice with salt and ghee. Mix well and consume. Vegetable juices: Carrot, apple, beetroot juices with little black pepper and a tsp lime juice reduces gas and bloating. Neem flower and salt: Fry 2 tsp dry neem flower with salt and asafetida by adding little oil. Mix this with hot rice and consume to reduce bloating and gas. 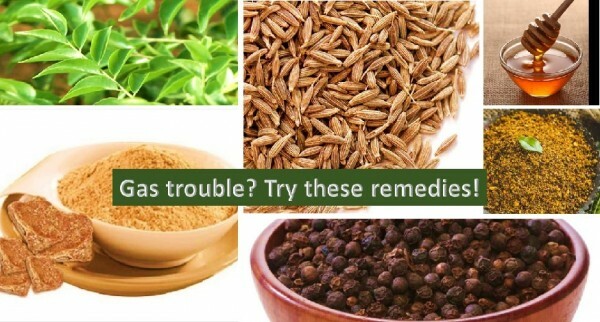 Try above remedies if you are not allergic to any of the ingredients.